If your project is analyzed on SonarQube or on SonarCloud, SonarLint can connect to the server to retrieve the appropriate quality profiles and settings for that project. Java 8 is required to run SonarLint. For any question or feedback please join the SonarSource Community Forum . 97 Cannot continue the operation. There is another install operation in progress. By adding the following code below to your website you will be able to add an install button for SonarLint. I was wondering if there is already a plugin for Eclipse C/C++ development. It is possible to use SonarLint in connected mode with SonarSource commercial C++ analyzer (assuming you are using CDT). You need to have a commercial version of SonarQube, or use SonarCloud. If you need help, please open a thread on SonarLint community forum. Looks like the sonar repository is down. We recently moved from bintray to our own hosting. But everything looks good to me. Can you open a thread on https://community.sonarsource.com/c/help/sl with the error you are facing? Error 404 on /sonar/api/system/status and this url works perfectly on my browser. I installed sonarLint in my eclipse luna. But don't see when I click in right button in my project! An internal error occurred during: "SonarLint analysis of project dashboard (1 992 files to analyze, 14 excluded)". If someone has already had the same error and knows how to solve it, any help is welcome ! how to close it ? Unable to read repository at h ttps://eclipse-uc.sonarlint.org/content.xml. Unrecognized SSL message, plaintext connection? I have the Market Place client installed. Any suggestions? Observation: I'm behind a proxy and configurated my proxy in windows --> preference --> proxy! This is a composite update site, so Eclipse should be looking first for https://eclipse-uc.sonarlint.org/compositeContent.xml (which exists). If for some reason Eclipse can't get the compositeContent.xml it will try as a fallback fallback to get content.xml (that doesn't exists). So the message is misleading. If you are behind a corporate proxy, I would check with your infra team why you can't fetch https://eclipse-uc.sonarlint.org/compositeContent.xml. The requested URL /content.xml was not found on this server. I can click on both of those links you provided, while in the office which does have a corporate fire wall, and I can retrieve both of the XML files. Is there a way to add SonarLint plugin using the dropins folder? Goal of installing this plugin is to see issues before actually shown on build machine. 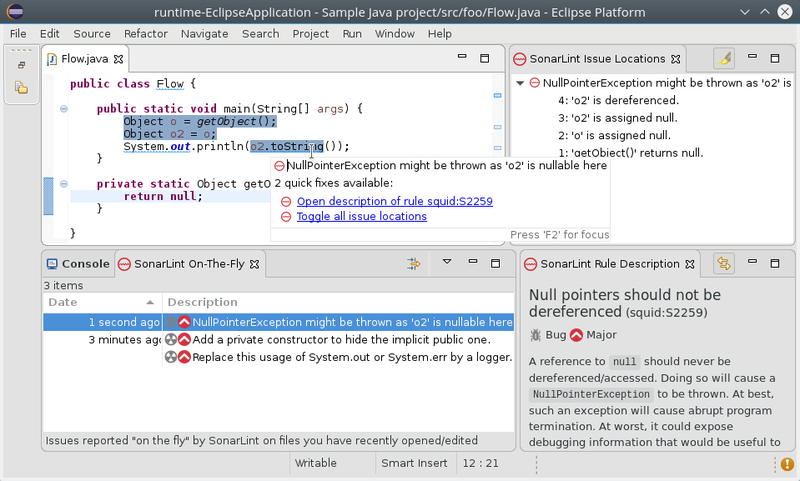 However, for me issues in Eclipse reported by sonar lint is different from reported on server. We are using server version 5.6 and sonarlint version 2.3.1. Is this plugin available for Eclipse Galileo? If yes please guide with the process to install it!! I got this error message in mars 2. I see that the file is available at www.sonarlint.org/eclipse/compositeContent.xml instead. Please download the zip and install as archive by selecting the downloaded zip in Install New Software option. This worked for me in STS 3.7.2. This is very strange since we have no relation at all with SourceForge. Can you please join SonarLint user group so that we can investigate (this is not the best place to handle support).